What it’s about: Recently, I was discussing what to make for dinner with my boyfriend. “Oh, I’m reading this cookbook…” I started. He interrupted. “Wait. You’re reading a cookbook?” “Well, yes,” I replied. “But it has lots of stories!” His incredulity made me realize that, of course, there are many types of cookbooks we don’t “read.” We refer to them, searching in the index under “pork chops” or flipping through until a glossy photo of lemon squares catches our eyes. 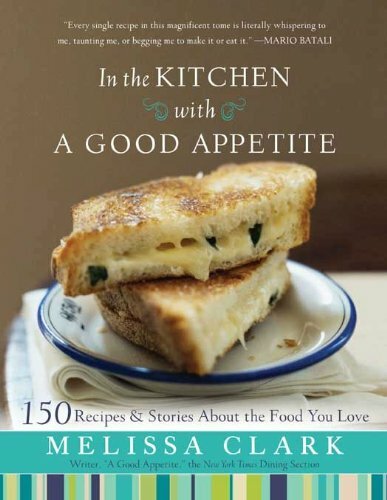 But there are some types of cookbooks that are meant to be read and Melissa Clark’s In the Kitchen with a Good Appetite is one of them. Clark begins each chapter with a short essay, usually including a story from her childhood or a special connection to the subject. Growing up, she and her sister traveled with their foodie parents around the globe, and their expeditions almost solely focused on food. Because of this, she was exposed to kinds of foods that children normally avoid like the plague–seafood, innards, slimy and spicy things. Her family also employed a technique that is very similar to my own family’s. When they went out to eat, each family member had to order a different dish. They would then eat precisely one-fourth of their meal and swap plates around the table clockwise. My family doesn’t do the organized rotation, but it is taboo in the Kenny family to order the same thing as someone else at the table. Clark also developed a cooking style very similar to my own, what I like to call the “what’s in the fridge” approach. She often asked friends or relatives for recipes and then tweaked them based on her own tastes and what was available that day. Sometimes the results seem quite close to the original and sometimes an entirely new dish was born. Each recipe begins with the story behind its creation. Perhaps it’s the Whiskey-Soaked Dark Chocolate Bundt Cakes she perfected in high school, trying to win the hearts of the boys in her class. Or maybe it’s a meal she tried to replicate based on a memory of dinner long ago, like her Not-My-Grandma’s Chicken with Lemon, Garlic, and Oregano. Maybe it’s her own update on a time-honored classic, like her Brand-New Heirloom Potato Latkes. Or maybe it’s one of the many recipes she “borrowed” from a friend or fellow chef and tweaked to her own liking, like the Really Easy Duck Confit, courtesy of Eric and Bruce Bromberg, Blue Ribbon restaurants, New York. Be warned: though Clark’s recipes sound delicious, she has rich tastes. She is prone to adding more butter, more sugar, or more cream than I would ever want in a recipe. You’d never know it from her slim appearance on the back of the book, but this woman has no qualms about using fat in the kitchen. I think if I were to make many of these recipes I would have to use lower-fat substitutions. Any woman who devotes a whole chapter to “Things with Cheese,” another to “Better Fried,” another to “My Sweet Tooth and Me,”and another to solely to Pie (“There’s Always Room for Pie”), has taken it one step too far for me. Was this really a Brooklynite, farmer’s market, food critic cookbook, or had I accidentally stumbled into Paula Deen’s kitchen?? Of course, there are many recipes in those chapters I’d love to try, like the Cheesy Baked Pumpkin with Gruyere Fondue or the Honey-Glazed Pear Upside-down Cake. But on the first read-through, the book can seem a bit stacked towards the heavy. I also still enjoyed reading her stories even while I cringed a bit when she added more butter to “improve” her dishes. Still, not all the dishes are fat-full, so there is balance in the book. She offers plenty of lovely dinners, like Spiced Chipotle Honey Chicken Breats with Sweet Potatoes or Lamb Tagine with Apricots, Olives, and Buttered Almonds. Borrowing Recipes: In the Kitchen with a Good Appetite had one major reoccurring theme: borrowing recipes. Clark has been a New York Times food columnist and a cookbook co-author, helping established chefs to write cookbooks and craft recipes that home cooks could follow. Because of this, she knows a lot of chefs and is steeped in cookbook culture. In many, many of her stories about the creation of a recipe, she credits another chef with the original. In fact, sometimes she only changes one or two ingredients and then adds her version to the book. And her reasons for changing ingredients are rarely because she thinks it will improve the original. Rather, she doesn’t have a certain ingredient in the house or thinks it will take too long to find or make. I found myself conflicted about this. What’s the point at which a recipe becomes your own? If I were the chefs she’d mentioned, would I be upset that Clark had included a variation on my recipe, even if she gave me credit? I’d probably want it in my own cookbook, wouldn’t I? If Clark had totally revamped the recipe, changing many quantities and core flavors, I would probably consider the recipe to be hers, no longer close enough to the original to count as mine. But if only one ingredient changes? Clark addresses this in one of her entries, saying that “all good chefs steal recipes” and “that’s how they build their repertoires.” But I would argue that good chefs are only “inspired” by other people’s recipes. I’d love to hear other people’s thoughts on this. Would I recommend? I very much enjoyed “reading” this cookbook and would recommend it to all my foodie friends. Clark is a great writer and her stories are light and enjoyable. Even though I personally found many of the recipes too rich, it’s only my own personal preference at work. I can see many of delicious and diverse meal coming from this book.